Soybeans were first introduced in Europe in the 1700’s and has since become one of the most important beans in the world. In the U.S., livestock such as cattle and pigs consume over 25 million tonnes of soybean meal per year. Soybeans are also used as a low cost food additive, in vegetable oil and as a protein source. Although tofu, soy milk and other soy products have been developed for human consumption, only a small portion of the crop is actually allocated for foodstuff. Soybeans were first produced and cultivated in China but nowadays the U.S. is the largest global producer of soybeans exporting approximately 37% of production. The top three states are Iowa, Illinois and Indiana. Another major producer is Brazil where soybeans are on par with coffee and sugar as one of the main exports. Like with most if not all agricultural products, weather has a significant impact on yearly crop yields. The U.S. Department of Agriculture release several important reports each year. The first is in March and is the Prospective Plantings report detailing how much and which crops will be planted by farmers in the upcoming season. Each month following sees the release of the monthly Crop Production report which estimates the supply and demand for soybeans. The final report is the Grain Stocks report which is released four times a year and looks at the supply of soybeans and various other grains on a state-by-state basis. Brazil is the second largest producer but the country faces opposition from various environmental groups that are concerned about the industry’s encroachment on the Amazon rain forest and the deforestation of Brazil. Trading hours: Soybeans trades daily Monday to Friday from 01:00 GMT and closes at 19:10 GMT. There is a daily break between 13:40 to 14:30. Spreads are usually higher during out-of-business hours. 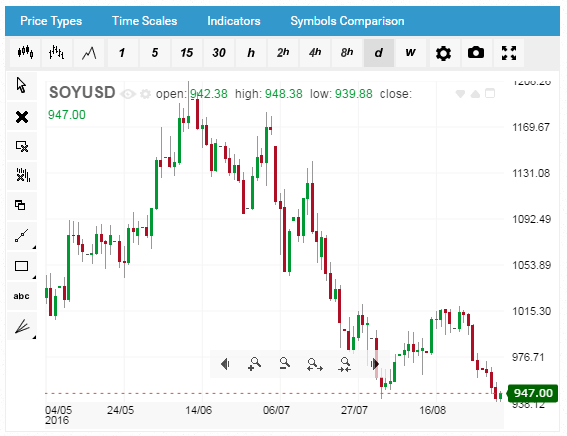 For more information on Soybeans and other related trading products, go to our blog website, forex.info.